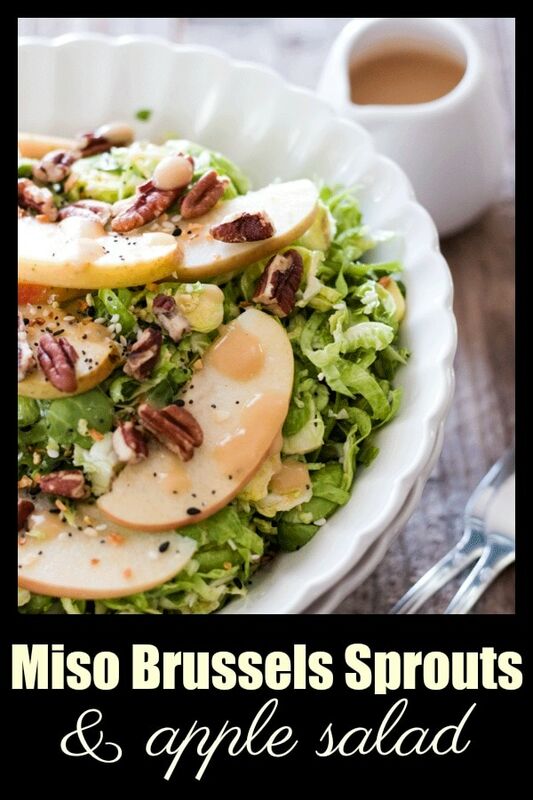 You are going to love this seasonal Miso Brussels Sprouts and Apple Salad. 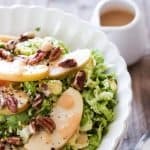 Thinly sliced brussels are given a quick marinade in a light miso dressing and then combined with some fresh crispy apples and toasted pecans. A light and zesty salad that is the perfect accompaniment to some grilled salmon or tofu. I absolutely HATED sprouts as a kid, as I am sure most of us did. I don’t even know how my mum cooked them, but they always came out boiled to within an inch of their lives and resembling a slimy mess, but we had to force every last one down before being allowed to leave the table (and we didn’t even have a dog to sneak them to)! Don’t worry mum has come a long way since then and her veggies are delicious now (love ya mum!). It wasn’t until recently that I realized just how good these things are when grilled, lightly sautéed or enjoyed raw with a zingy dressing. Oh my gosh, yum! How do you like your brussels? 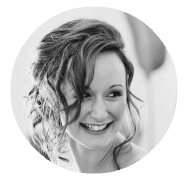 I just love to hear from you so be sure to leave a comment and share all your delicious ideas with us! 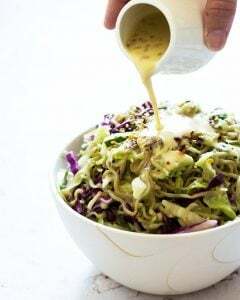 And if you try out our Miso Brussels Sprouts and Apple Salad let me know how you go! Happy Eating. Core the apples and slice into thin wedges, toss with the lemon juice and set aside. Using the slicing blade attachment of a food processor, shred the brussels sprouts. You can slice thinly by hand if you don't have this attachment. Pop the shredded sprouts into a large bowl. Add about 1/3 cup of the miso dressing and give the sprouts a good massage (trust me, this makes them much more tender and delicious). Add in the spring onions and give it a good mix. I almost always roast my brussels sprouts – I just love how they caramelize. But shaving them and then that miso dressing has me thinking it needs to be my next approach with the bag that’s in my fridge right now! 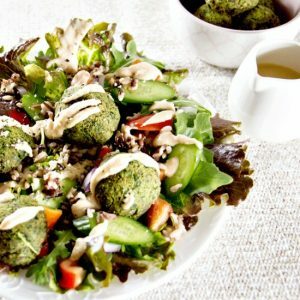 I have awful memories of mushy Brussels sprouts… I need to try this version! It looks so light and delicious! Sooo, I’m the crazy person who loved Brussels sprouts as a kid. Hahaha. They’re one of my favorite vegetables, but I’ve actually never had them with miso. It must be such a perfect pairing. What a great salad to bring some brightness to the winter months. Will definitely be making this soon! Haha, my son will join you on that crazy person list (he makes me buy them every time he sees them at the farmers market!) I on the other hand didn’t develop sprout love until I was well into my twenties 🙂 Hope you love it!! Oh, I also just recently found out how brussels sprouts grew on the stalk and it made me laugh so hard. Isn’t it just a funny looking vegetable? The idea of adding a miso glaze sounds so delicious. 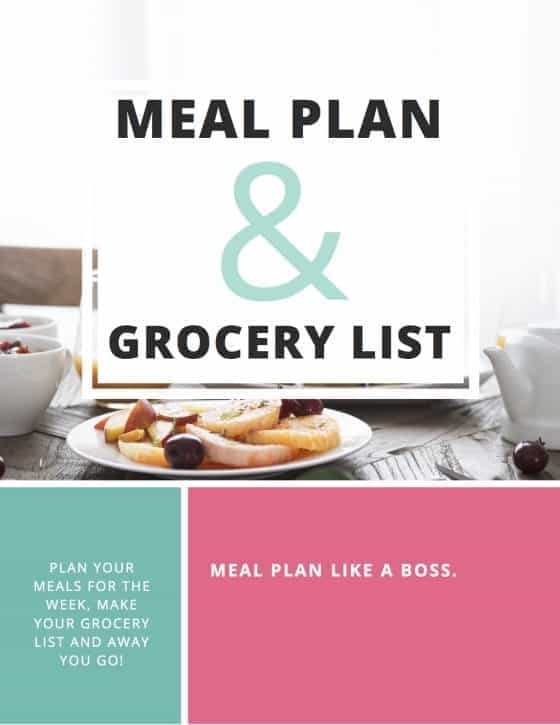 I can almost taste it and I bet it makes the salad seem a lot more filling that it actually is making it ideal for light dinners. Miso is just such a magical ingredient! So weird looking!! Miso is the best, we use it in so many different dishes, just adds that perfect flavor.